Today’s Eastern Conference games both ended in home victories, and both saw the seeded team open a 2-0 lead in the series. But that’s where the similarities end. While Avtomobilist had relatively little trouble in seeing off Traktor 4-2, Barys produced the biggest fightback in a playoff game since 2012 to defeat Torpedo 5-4 in overtime. Hockey is usually a game of three periods; today’s match-up in Astana borrowed a hoary old soccer cliché to produce a game of two halves. In the opening stages, Torpedo powered into a 4-0 lead and looked well set to tie this Eastern Conference series. Then it all changed as Barys clawed its way back into the game to win it in overtime. The Kazakh team completed the biggest single-game fightback in a playoff game since Traktor recovered a 2-6 deficit to win at Ugra in 2012; now Torpedo heads home to Nizhny Novgorod contemplating a recovery almost as epic if it is to advance through this series. As in Tuesday’s game, Torpedo got the opening goal. This time the visitor took just 101 seconds to get on the scoresheet, with Anton Volchenkov firing home a Mikhail Varnakov feed. The visitor felt it had a point to prove after ending on the wrong end of a 4-1 scoreline two days earlier in a game that was rather closer than the final score suggested. Barys pressed hard for an equalizer but was caught out again late in the frame when another turnover in center ice sent Varnakov clean through to make it 2-0. After the intermission, Robert Sabolic shot home an Andrew Calof pass to make it 3-0 and bring Dominik Hrachovina to the crease in place of Henrik Karlsson. Sabolic also scored on Tuesday in a losing cause but it looked like the Slovenian was on to a winner here, especially when Kirill Urakov and Daniil Ilyin coverted an odd-man rush to make it 4-0. The turning point came in the 29th minute; those two halves would prove to be slightly unequal. For Torpedo, Anton Sagadeyev’s goal was a tough one to swallow. The visiting bench immediately claimed that the forward, who got the redirect on Valery Orekhov’s shot as he stood in front of Barry Brust’s net, had encroached onto the paintwork. The replay showed that while Sagadeyev’s skate had crossed the line, he withdrew it before Alikhan Asetov made a pass from behind the net to find Orekhov. Torpedo’s failed appeal cost it a time-out, something that it would come to regret late in the game. The goal handed the initiative to the home team. 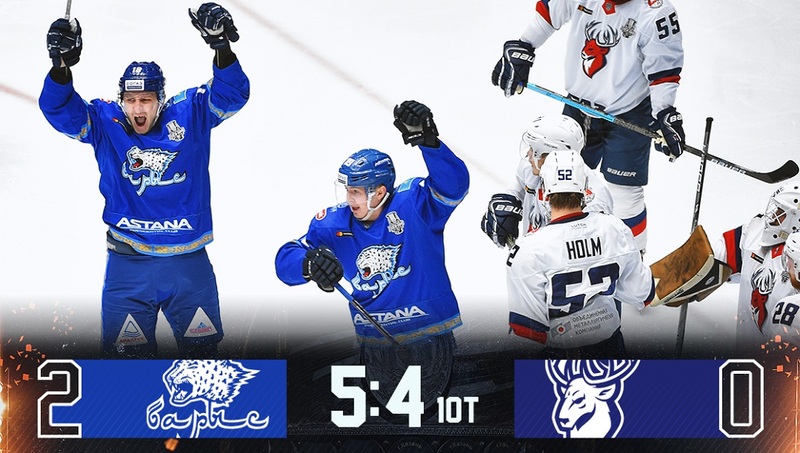 Barys had always looked to be offering more than the scoreline suggested and, having found a way past Brust, the home team redoubled its attacking efforts. The second period would finish with the shot count reading 21-5 in the host’s favor; Dmitry Shevchenko added a second goal. The third period brought more home offense, with Torpedo simply trying to contain the pressure. For a long time, it looked to be working, but in the 55th minute Darren Dietz tied the scores when he crashed to the ice under the challenge of Volchenkov but still manage to force home an Andre Petersson pass from behind the net. It was a moment when Torpedo needed calm heads, especially after losing Philip Holm on an interference call. But there was no time-out on offer for David Nemirovsky and Barys continued to tighten the screws. In the 59th minute, the tying goal came. Curtis Valk, who had three assists on Tuesday, got an even more important one when he took the puck around the back and slid it out to Matthew Frattin. The forward hit a one-timer that was going wide of the target until it took the cruellest of deflections off Denis Barantsev’s skate and bounced between Brust’s glove and the post. The expressions on the faces of the Torpedo players told their own story; the visitor was in no psychological state to deal with overtime. Just 100 seconds into the extras, Roman Starchenko’s point shot flew into the net to complete the great escape. Barys takes a 2-0 lead to Nizhny Novgorod for Saturday’s game. We asked the guys to play a bit differently, to look for quicker decisions. We made a good start, we skated well and opened a 3-0 lead. But then we started to get away from the gameplan, players started thinking of their own game. When we got the fourth I told the guys to stick to the system but again our defense started coming out of position. We allowed a goal and handed the initiative to Barys. They started skating well, raising the tempo and we couldn’t live with it. They got it back to 4-3, there was a penalty late in the game and they managed to tie the game and quickly win it in overtime. It’s a valuable lesson for us, we need to do play the right way for the whole 60 minutes. That’s the only way to win games. Now we’re down 0-2 in the series but we’re heading home. I’m hoping for a real battle and our fans will get behind us. We want to come back here with the series tied at 2-2. Why did your team look to be physically weaker in the third period again? I wouldn’t say we were weaker. It’s a fast game and we needed to take decisions quickly on the ice. But we started thinking too much, we didn’t move the puck. We made mistakes and the puck kept coming back to our zone. And when you’re always playing in your own zone, you get tired. I think that’s a lesson for all of us. I wouldn’t say we started badly but we didn’t have the kind of energy that a team needs at the start of a playoff game. I’d like to thank our fans, they really stayed with the guys tonight. We found the strength to change the game and eventually to win it. This team has character. Can you comment on Karlsson’s withdrawal? Like I said, there was no edge, no energy to our game. We needed to do something. Goalies don’t always get pulled because they are playing badly. This time we just needed to make a change and show the team that we weren’t giving up on it. That’s why we made the call. 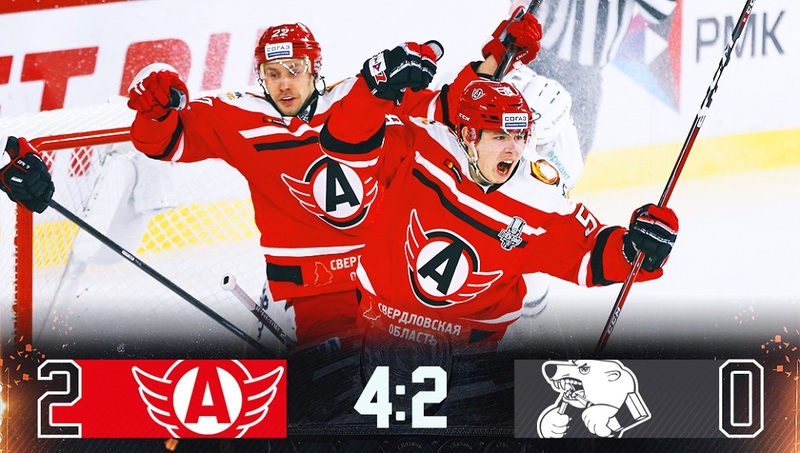 Avtomobilist urged its fans to come to the arena in the club’s red and white colors – and duly obliged the home support by delivering a second successive victory to take a firm grip on this series. However, there were some encouraging signs for Traktor, especially in the first period, with the visitor suggesting that it might be ready to stretch the top seed in the East when the action moves to Chelyabinsk at the weekend. Initially, everything went perfectly for the host. Andrei Obidin, recalled to the team after missing the opening game, stormed forward in the third minute to open the scoring. The Avtomobilist forward gave himself the perfect present on his 22nd birthday. However, the rest of the first period was dominated by Traktor, much to the discomfort of Andrei Martemyanov behind the home bench. Jakub Kovar made a big save to deny Christian Thomas in a one-on-one, but right before the hooter the visitor tied it up through Grigory Zheldakov. There was a big conversation in the home locker room during the intermission and Avtomobilist’s big guns responded to fire the team to victory. Nigel Dawes potted a power play goal and soon afterwards Anatoly Golyshev scored a short-handed effort after robbing Igor Polygalov of the puck and streaking away to beat Vasily Demchenko. Dawes, now in dominant mood, might have had another; a coach’s challenge saw his third-period effort ruled out for goalie interference. The teams found time to trade goals late on. Alexander Kucheryavenko scored a power play goal of Dan Sexton’s feed in the 58thminute before Traktor responded through Anton Glinkin to make the final score 4-2. It was a good, hard-fought game. Our opponent took its chances, but we also had decent chances to score. We understand what we need to work on, we’ll look at this game and prepare for the next one. I’d also like to thank the fans who came to these road games. I hope we’ll enjoy good support at home as well. Overall, I’m happy with the team. Everyone was 100% prepared. There are things that we need to work on. Obviously we didn’t get the results we wanted but the guys battled hard for everything. I’m happy with the result but I wasn’t at all happy with the way we played in the first period. I didn’t see any teamwork at all. In the intermission we had a serious talk. That refreshed us and we started to show the kind of hockey we can play. I’m proud of the way the team recovered, but there’s no way we can start another game like that. I’ve no complaints about anyone’s commitment, we blocked a lot of shots and our goalie did well again. Nobody wants to lose. This is hard hockey, man’s hockey. Every game is fought tooth and nail and you’ll see some provocations both in the game and on the sidelines.